Last week, we were completely caught off guard when I discovered via my Facebook news feed that Yuan Works had quietly re-released Wind & Water: The greatest worst selling Dreamcast game. I was so stoked that the classic puzzler was getting another chance to find love within the Dreamcast scene, that I overlooked another puzzler, Orion Puzzle Collection, which was released only a few days prior on June 27th, 2016. French developer Orion has been circling the Dreamcast scene for many years. I first discovered him on the DC Emulation Forums, where he was potentially fishing for a publisher by demoing cross-platform builds of his four games: Alice’s Mom’s Rescue, Elansar, Philia, and Yopez IceStar. Shortly thereafter, he was discovered by the undisputed German heavyweight champion of the indie Dreamcast scene, Rene Hellwig of Hucast Games. Even though Hucast is primarily known for releasing various iterations of Dux/Redux, they have been stepping up as a European distributor after the fall of Redspotgames, and that is a good thing. 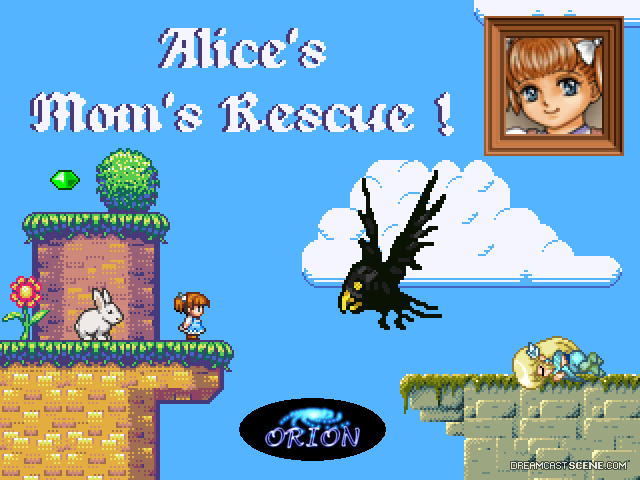 In January 2015, they made their Dreamcast debut with a cutesy (expect to read this word a lot in my articles), sprite-based 2D retro platformer titled Alice’s Mom’s Rescue. Alice’s Mom’s Rescue was evidently inspired by Lewis Carroll’s children’s’ book, Alice in Wonder Land. Those who have read my piece on the Wind & Water re-release know that I am open to 8-Bit games on SEGA’s 128-Bit console. What I am not open to, however, is them being full-priced games. After over a decade Dreamcast has a new platformer. Does it matter if it is an 8-bit port? Alice’s Mom’s Rescue was released for Dreamcast for approximately US$30 and US$50 (original price is Euro’s) for regular and limited editions, respectively. The regular editions was given the typical Redspotgames faux Japanese jewel-case treatment, where as the Limited edition came in an NGDT style faux Japanese DVD case. As always, the limited edition featured an alternate box art and was paired with the soundtrack CD. The game was considerably uneconomical, considering it can be bought for a fraction of that price on numerous other downloadable platforms such as Mac, Windows, Linux, and more. Hucast did receive criticism from the community and allegedly from the developer as well (could not find a source, just internet gossip), who stated that the game was overpriced. All things considered, I think the publisher did a serviceable job with the game. This was Hucast’s first time publishing a 3rd party game and while the price tag may be high, it could potentially be justified. 8-bit or not, this is the first commercial Dreamcast platformer in “donkey years” (I don’t know what donkey years are but it sounds pretty long). Point and Click adventure game. Another genre Dreamcast Sceners haven’t experienced in over a decade. In August 2015, Hucast took the criticism in stride and bundled Elansar & Philia, which makes sense as both are point-and-click adventure games and Philia is the sequel to Elansar. The game was only available in a single standard DVD case edition and was commercially released for US$ 29.99 (which makes each game $15). Fast forward to June 27th, 2016 and it appears that Orion has decided to go fiercely independent, or Hucast has opted out of publishing the game. Whatever their motivations might be, the final game from the November 2014 DC Emu post has been quietly released independently by Orion. Here’s the fun part; the final game was Yopaz Icestar, a simple 2D puzzle game. Surprisingly, Orion released two more games in the Orion Puzzle Collection. To bluntly share my impressions, the absence of a publisher is immediately felt. 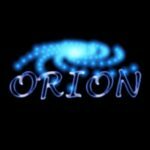 There has been almost no marketing efforts beyond a game page on Orion’s official website. The website, which seems to have escaped from the 90s, includes an amateurish and poorly edited game trailer. Orion’s Puzzle Collection includes the aforementioned Yopaz Icestar, Yopaz 3D (A 3D remake of IceStar, duh!) and lastly, Turtle Chomp. Even with brief gameplay footage, I have not been able to discern what the game is about, and its official description, “a little surprise, a fun and casual puzzle game full of Internet meme & Omnomnomnom” doesn’t help me understand anything either. Orion Puzzle Collection (blue one on top) and Leona’s Tricky Adventure (green one right below) tend to stick out. Other than turtle chomp, the games seem to be simple intuitive fun. I dug around a little bit and it turns out Yopaz 3D and Turtle Chomp are Dreamcast exclusives (though the game disc is compatible with Windows PC’s). I will be honest there is nothing terribly exciting and die hard collectors will be bemused with the rogue packaging style similar to KTX Software’s Tricky Leona by not adhering to any of the indie packaging norms. I will be honest, Yopaz 3D does look like an attractive game, especially since it comes with a level builder however the games steep €30 (Approximately $34) price tag is uneconomical even with shipping and tracking included. Those interested in a more economical puzzle game can check out Yuan Works recently re-released Wind & Water: Puzzle Battles for $15 with shipping. American players may also want to check out the original GSP Puzzlers from the early days. We have contacted the developer for a review copy and will share our impressions with you, if and when we receive a copy. 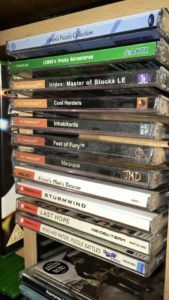 Editor Note: Special thanks to Forbes Longden for providing us the photograph of the game spines and confirming that the game disc has the exe files to boot up on a PC.